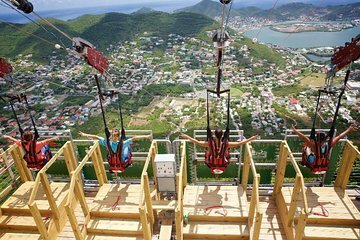 Take in rare aerial views of St. Maarten and the surrounding landscape on a zip line course with convenient round-trip transport from the Philipsburg pier. In addition to guided instruction, the day’s itinerary includes an admission ticket to an historic plantation museum that educates visitors on the island’s legacy of slavery. My husband and I chose this tour as part of our honeymoon while stopped in St. Maarten on a cruise. The Rainforest Adventures part of the tour The Sky Explorer and Flying Dutchman is an amazing experience! Unfortunately, the transfer from the pier and back was quite disorganized and led us to missing time on the rest of the island, otherwise it would have been a 5 star excursion. The lift and zipline are run by a company called Rainforest Adventures, and there is also a shorter zipline and a water tubing area at the park that were not included in this tour. About a half hour ride to the top of the mountain on the sky explorer ski lift, and once at the top you have the most amazing views of the entire island! There are viewing platforms around the top to ensure you can see the island from many angles. The staff working at Rainforest Adventures are kind and outgoing, and made sure we felt comfortable during the whole experience. The Flying Dutchman zipline itself feels very secure - this was my first time ziplining and as someone who has always had a fear of heights, I am so happy I was able to conquer my fear and do this! You have a beautiful view as you zipline back to the bottom of the hill, and the option to buy pictures of yourself coming to the bottom of the hill in their lovely gift shop. As for the transfers to and from the pier, we expected we would be greeted by a tour operator and transferred to the site in a van with other cruise passengers, however after much wandering around the cruise port and speaking to numerous port staff about the excursion, we realized the taxi dispatcher was to arrange for a cab for us. The cab driver was unsure who was supposed to be paying him, as the voucher stated we had pre-paid for our transfer, and he left us looking quite frustrated. On the way back, we waited almost an hour for the staff of Rainforest Adventures to book a return cab for us. If we had known the transfers to and from the port would be this complicated, we would have arranged cabs on our own and just paid admission at Rainforest Adventures on arrival or booked our tour through the cruise line instead. 5 stars for the sky explorer and flying dutchman, but probably 1-2 stars for the complications with the transfers to and from the pier.